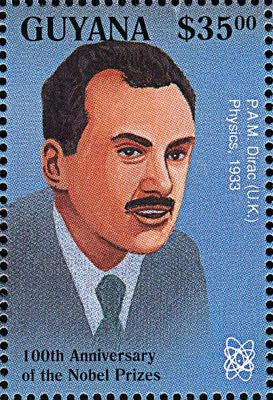 The postage stamp of Dirac, issued in Guyana, 1995; taken from Joachim Reinhardt's Web site, "Physics-Related Stamps." On page 12 of Dave Goldberg's The Universe in the Rearview Mirror: How Hidden Symmetries Shape Reality (Penguin, 2013), I have found the words, "the French physicist P. A. M. Dirac." Dirac was an English. However, there is the following story related to French language: In his childhood, Dirac was forced to speak in French by his father, who was a French teacher, and it became one of the causes that made him a man of few words. There was a similar error, "Yukawa H., Japanese–French" on page 494 (Biographical Index) of MacMillan Dictionary of the History of Science, edited by W. E. Bynum, E. J. Browne and Roy Porter (MacMillan, 1983). In line 10 from bottom on page 313, the two theorists Yoichiro Nambu and M. Y. Han are referred to as Japanese. However, Han is not Japanese but Korean. I think that this error was overtaken from A. Pickering's Constructing Quarks. L. M. Brown pointed out the same error in his review of that book [Science Vol. 228, p. 857 (1985)]. — Taken from my Web site essay "In Search of Errors," which is just the quotation of the letter addressed to Gribbin. Why is the nationality of theoretical physicists sometimes wrongly attributed? The probable reason I think is as follows: Nationality is less important in the history of physics or science than in the history of other human activities, so that authors writing about historical events of physics or science are not so careful about it.